Recorded on February 22, 2016. 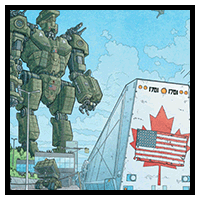 A heroic band of Canadian civilians-turned-freedom fighters must defend their homeland from invasion by a technologically superior opponent…the United States of America. Hey I also wanted to say You guys should check out spread. It is sort of a horror comic. But its really good . I think it would make a could topic. !